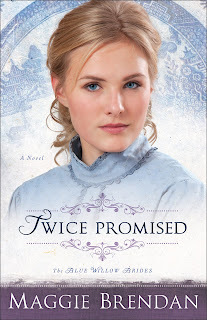 Twice Promised by Maggie Brendan is pure fun. Curl up on the couch with a blanket, turn off your phone and prepare for an afternoon/evening of delightful reading. Two brides one groom and that means TROUBLE for someone. The story is set in Central City, Colorado. A place I've been researching for a book so reading about it in Twice Promised made the town even more alive for me. The Blue Willow Brides books would make a nice Christmas gift for someone. The first book Deeply Devoted was also a good read. You can read my review of it here. Greta Olsen arrives in Central City, Colorado, as a mail-order bride, expecting to marry Jess Gifford, the man she’s come to know through his tender letters. But when the dust clears, she meets Cora Johnson and discovers she’s not the only bride waiting at the train station for Jess. Oh, you must take time to relax and read or the self-realization stuff will cause you to burn out. ;) No, I haven't read The Mermaid Chair. I might hint to my daughter that she buy me this for christmas, thanks I love to loose myself in a good book.